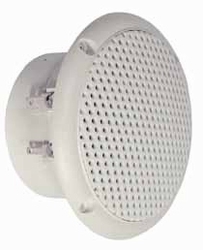 Saltwater resistant 8 cm (3.3") full-range speaker with moulded plastic cone, plastic basket and grille. Absolutely corrosion-resistant and waterproof due to encased magnet and silicon-coated leads. Clear-cut high-range output. White colour.